The Arthur Conan Doyle Weirdnight – Photographic Evidence! The Conan Doyle Weirdnight was tremendously entertaining. Though initial attendance was not huge, by the end many pubgoers had been tempted in by the sight of men in fancy suits! There were three readings. Here is Joshua Roberts, reading from "The Captain of the Pole Star". Unpleasant Tales collects twenty-two short stories from Brendan Connell, who contributed "The Putrimaniac" (included here) to Dark Horizons 54 last year. Anyone who enjoyed that story will find much more to their taste here. For those who didn't have the pleasure, titles like "A Dish of Spouse", "The Skin Collector", "Mesh of Veins" and "The Cruelties of Him" give a good indication of what to expect, although every so often there's something like "The Nasty Truth About Dentists" to lighten the mood. On the whole, these stories live up to the book's title extremely well. "For an artist, all experiences are exquisite", claims the protagonist of "The Tongue", and this collection pushes that idea to its limit. The artists here are experimental to the fullest horrific extent of the word, though I hesitate to give examples; best discover them yourself for the complete effect. The selfishness of the artistic impulse, its lack of regard both for others and for one's own best interests, is here shown at its very worst. There's not a story in here that wouldn't have been accepted for Dark Horizons in an instant, and taken alone each is rather brilliant. Reviewing the collection as a whole, a formula reveals itself: a character, usually male, is introduced, and then we discover his obsession – music, odour, body piercings, food, plants, tattoos, and so on – and learn about it in some detail, and by the end that obsession has overwhelmed him, usually with deadly consequences. Some stories break away from the formula, but I would recommend taking this collection a story at a time, rather than reading it all at once, to avoid that sense of repetition setting in. It's very well written, full of interesting words, and evidently well-researched throughout, given the level of detail. However, in a very literary book, typos can unfortunately be quite harmful to the overall effect, and there are quite a few here – and as in some other Eibonvale books they grow more frequent as the book draws on. Bobble for bauble and course for coarse stand out, as does "He fed her on a strict diet of deserts". In the end, though, far better to have been able to read this book, typos and all, than not to have read it at all. Unpleasant Tales , Brendan Connell, Eibonvale, hb/pb, 284pp. The first two stories in this collection stand alone, in setting if not theme. In "The Cinema of Coming Attractions" the leader of a street gang in a sun-baked coastal town near Marseilles falls for a young film star who's conscious she won't be young for much longer. She takes him to the cinema of the title. It's a cool, calm tale which reminded in a good way of Basil Copper's recently re-published stories. An Australia enriched by an inland sea and facing war with China is the setting for "Int. Morgue. Night. ", a hard-boiled spy thriller. These are followed by four tales of Caeli-Amur, a renaissance city of feuds and assassins perched on a white cliff, where botany, magic and technology have converged in a way that would have thrilled Doctor Lerne. House Arbor and House Technis are locked in a never-ending battle, minotaurs live to the north, and a marble city off the coast is patrolled by a gigantic sea-serpent. The fourth and perhaps best of these stories, "Lost in the Library of Forgotten Books", takes place in a city or town to the north of Caeli-Amur, where Alisa files away forbidden books, protected only by an amulet from the library's twisting, hungry guardians. If the book has a theme, I think it's doomed or impossible love. The first three stories concern lovers who are prisoners of their situations, the fourth a widow in love with the public image of her dead partner, the fifth an assassin in love with her target, and the sixth a librarian intrigued by the writers whose books she buries in the stacks. In but one of the stories is escape from the trap truly possible, and even then it's thanks only to the protagonist's newly discovered thaumaturgical powers. But though Rjurik Davidson's world can be bleak, it's full of beauty and imagination and ideas, where even the grossest distortions of the human body are described with careful eloquence – and in trapping its characters, or forcing them apart, it reminds us of our own freedom. The Library of Forgotten Books, Rjurik Davidson, PS Publishing, hb, 162pp. Count Marechal would see the Mirkarvian empire restored, but the emperor died three hours ago – before a crucial speech could be given. 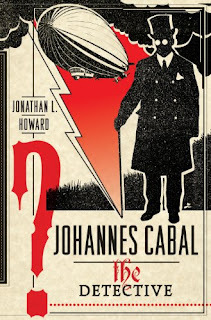 Thus Johannes Cabal escapes execution for necromancy (and related book theft), but the episode ends badly, and Cabal escapes on an aeroship – the Princess Hortense, on her maiden cruise – in the guise of Herr Gerhard Meissner, docket clerk first class, Department of Administrative Coordination. There are murders; Cabal investigates. This was very enjoyable. Both narrator and character are quietly funny, and there's a touch of the Stainless Steel Rat about Johannes, both in his humour and his disdain for the law (and at one point it is said of him that you should "set a monster to catch a monster"), though he does not share his science fictional counterpart's regard for human life – having defeated an enemy, he thinks it best to kill them while they are "handy and vulnerable". Nor does he share the Rat's interest in women. Indeed, he "usually carried a faint scent of formaldehyde around with him, which had the effect of depressing any amorous intent of any woman with a working nose", so the attention he attracts from femmes fatales during the voyage (enforced absence from his laboratory having done much for his odour) comes as a surprise and a challenge. There are also echoes of Keith Laumer's Retief tales: Cabal is a capable man on a world of militaristic idiots, sadists and popinjays, a world with one foot stuck in the 19th century. Unlike Retief, Cabal has a capable, intelligent woman to deal with: Leonie Barrow, a criminologist from his past with the uncanny, infuriating ability to awaken his "feelings" and "conscience". Their uneasy unfriendship provides many of the novel's best moments. Special mention must go to the wonderful cover, a striking piece of art and design by Michael Windsor. The back cover reproduces the first three paragraphs of the novel, showing a classy and I think justified confidence in the author's writing, which is sparky, amusing and dramatic. The last thirty pages of the book offer a bonus feature: "The Tomb of Umtak Ktharl", an entertaining novella which succeeds the events of the novel. Johannes Cabal the Detective, Jonathan L. Howard, Headline, hb, 380pp. I'm having a very literary fortnight. Last night was the twin launch of Michael Wyndham Thomas's Port Winston Mulberry (designed by Littlejohn and Bray) and Roz Goddard's The Sopranos Sonnets (Nine Arches Press) at the extremely impressive Priory Rooms in Birmingham. On Saturday night (July 17) we'll be launching our own new book, The Conan Doyle Weirdbook, as part of Oxfam Books and Music Moseley's Conan Doyle Weirdnight. It's at the Prince of Wales pub, Alcester Road, Moseley Village, Birmingham, starting at 7.30pm. More details here. The price of admission, don't forget, is a book donation! The Weirdbook will be exclusively available from Oxfam Books and Music Moseley for a period, before being made more widely available. The wonderful cover art is by John Shanks. And then the Saturday after next (July 31) we have the British Fantasy Society open afternoon in London: 1pm until 5pm at the The George, 213 Strand, London, WC2R 1AP, featuring Angry Robot's Lauren Beukes. More details here. Eibonvale Press here takes a very successful first step into comics publishing. The artwork, most of it originally appearing in fanzine-type publications in the eighties and nineties, looks fantastic, Pinsent's bold black lines reproducing with perfect clarity – though if you flick through without reading you might imagine it formless nonsense, such is the variety of strange, apparently random imagery it presents. However, once you begin to read, the coherence of each individual story becomes clear. Useful notes from the author help clarify his intentions, but leave room for the reader's personal response. Among my favourites were the two-part tale of The Last Eskimo, who awakes from a ten-thousand year freeze to hunt down the wandering moon, and The Lion Sleeps Tonite, about a stationery thief confronted by his own criminality. After a series of equally varied and interesting shorts – divided into humorous tales, fables, family tales, Astorial anecdotes, poems and dark tales – the book takes a slight dip with the first three Windy Wilberforce stories. Predating many of the other strips, they are a little dull and over-long (not to mention that their tale of stupidity caused by "nigrification" is open to a very unsympathetic reading), but important parts of the collection in that they establish Windy as an essentially decent human being. With the next story things are back to the usual high quality – but Windy himself is at his worst, becoming a paper dictator and earning himself the wrath of the world's trees! After an odd pair of shorts, the last ninety pages are devoted to a hallucinatory, prophetic Wilberforce epic, The Saga of the Scroll, which is breathtaking, ambitious, experimental and not a little baffling, in the best possible way. Well worth the attention of anyone interested in indie comics, or indeed anyone who has enjoyed other Eibonvale books, among which it sits very comfortably. Through poisonous treachery Lord Godless has captured the Emperor of China. Unable to defeat the invincible atheist, the great generals of China incinerated, Wind and Cloud retreat to gather their strength. Wind walks Lord Wicked's path of evil, the dangers of which are shown by Wicked's decision to cut off his own arms, to limit his own evil-doing. Cloud takes on the powers of master Nameless, creating twenty-three new sword styles of "divine superiority" along the way, collectively known as "Ba!" Time for a rematch! The special effects in this film are often fantastic: it's a video game come to life. Aaron Kwok and Ekin Cheng return to the roles they originated in Andy Lau's 1998 film The Storm Riders (which I found a little underwhelming), and Wind and Cloud look like they've stepped out of a Squaresoft cut-scene. As in The Eye trilogy, and even their otherwise slightly disappointing American film The Messengers, the Pang Brothers make brilliant and often subtle use of digital effects. Much like 300, 95% of the film is computer generated, estimates Oxide Pang in the special features. It's not a perfect film: its adoration of 300 is not restricted to technical issues, certain shots and costumes feeling more like cheap imitations than homages. The female characters have little to do but look serious and pretty (and in many cases die) and the two heroes are a bit soppy and stiff. But in a film where the main draw is the fighting those flaws can be overlooked. At worst reminiscent of clunky, melodramatic but fun Indian telefantasy, at best quite fantastic, this is one of the better movies of its type I've seen since Zu Warriors of the Mystic Mountain. If it had featured a character with extensible eyebrows, or even a scene where the heroes took on a decently-sized army or two, it might have beaten even Zu. I didn't always understand what was going on, but when it happened I was enthralled. The DVD includes a commentary by Bey Logan and 80 minutes of interviews and special features. 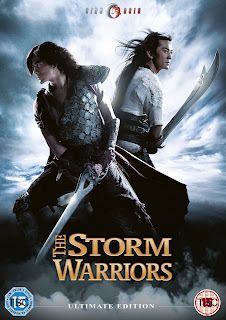 The Storm Warriors, Pang Brothers (dir/wri), Cine Asia, 106mins. This semi-sequel to real-life events begins with a group of Australian students being cautioned and interviewed about the evening of 12 September 2007, when Angela King, a beautiful, insane drama addict (played by Heartbreak High vet Lara Cox), threw a farewell dinner party. A farewell to life, that is: she and boyfriend Joel planned to kill themselves after dessert. Anything to avoid charades! Their insufferable student friends came to spectate and cheer them on. But Joel knew nothing about the suicide plan, and no one thought to tell him. This is a decent stab at making a high concept film on a very low budget, but it wasn't terribly exciting to watch. Fifty minutes of story are padded out with lots of moody montages, while police interviews and flashbacks to Joel and Angela's first meeting add little to the film. Issues of complicity and moral courage are raised in a perfunctory way, and there's a curious lack of weight to it all. Knowing from the beginning that most of them survive kills much of the tension. The only question left is whether things will play out as you are led to believe, or if there will be a twist. But I wasn't made to care – the speculation felt academic. By far my favourite part of this film was the appearance of the paramedics at the end: they felt crushingly real, people getting on with their jobs, following well-worn routines in the most ghastly of circumstances. Perhaps that's because they were real: the emergency services are thanked in the credits. Credit also to the music, by Fire on the Hill and The Andi & George Band, a melancholy atonal noise with swings towards Tangerine Dream cosmic rock. 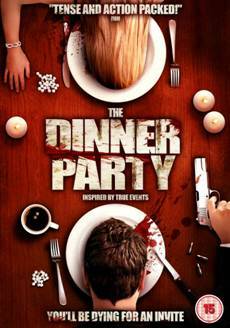 The Dinner Party, Scott Murden (dir/wri), Kaleidoscope, 88mins. As with Stephen Baxter’s Starfall, it’s thrilling to read a story that could have been stretched out over 800 pages compressed into 80. This one is all about the damage that can be done by a determined, intelligent, brutal person who doesn’t care about the consequences of their actions, in this case a man determined and, he believes, destined to restore the Zulu kingdom (and then some). When playing a game, I’ve little to no interest in reading characters’ journals, game encyclopedias or watching any cut-scenes. I just want to get on with playing. It’s ironic then that I’ll lap up a tie-in novel like this or the Elder Scrolls novel, The Infernal City. As a result this novel filled in much interesting background information for me, stuff that probably wouldn't have come as a surprise to other players of the game – that there are no Asari men startled me – and if some sections felt like info-dumps, it was information I was happy to have dumped on me. The feel of the game is here in spades, and I don’t just mean the long lift rides, though they are present and correct! Conversations here are crucial, poised on a knife-edge, just as in the game. Descriptions of the awe induced by a fully-armoured krogan will resonate with anyone who’s played the game. It’s surprisingly brutal – Saren, villain of the first game, is here in his uncorrupted prime, the Jack Bauer of the spaceways, torturing his way from one nonce to another, on a route leading him inexorably to his fate at our hands at the end of the game. A good, exciting novel, and if reading it felt like something of an indulgence, I don’t think this book would have been at all embarrassed to have been published, for example, as part of Baen’s line as an original novel. Mass Effect: Revelation, Drew Karpyshyn, Del Rey, pb, 323pp. Blue Forgotten Planet begins with the filming of a charity appeal to help the people of planet Earth, presumably something to do with the gigantic crater discovered by the Sixth Doctor (Colin Baker) and someone he thinks is Charley Pollard (India Fisher) upon their arrival. In an echo of The Ice Warriors, as humanity clings to survival it splits into two factions, those who cling to civilisation, and those who go back to basics. Here it’s foresters on the outside, grubbing for food, led by Driscoll. In this case, though, the return to nature is not a matter of choice. There aren’t enough meds to go around, and when people don’t take their meds they get angry… They suffer from the Magnus, which robs them of their memories, leaving only their worst emotions. On the inside, a privileged few led by David McAllister receive medical supplies – from the Viyrans, played by Michael Maloney, after they stole his voice from Fratalin during their brief appearance in an earlier story, Patient Zero. Meanwhile, the real Charley, having spent a very, very long time in a spaceship that looks “a cathedral built by a plumber”, completing missions in return for help, is on the trail of the Doctor and her doppelganger. After a pair of claustrophobic stories for this Tardis team, the wide open sky of Blue Forgotten Planet contributes to an epic feel, appropriate for what proves to be the final story of one of the Doctor’s longest-running companions. The Sixth Doctor could have done with a story this well-crafted on television. Listen right to the end! Doctor Who: Blue Forgotten Planet, Nicholas Briggs, starring Colin Baker, Big Finish, 2xCD, 2hrs26. 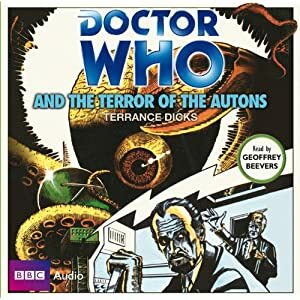 The latest Doctor Who audiobook from the BBC is an adaptation by Terrance Dicks of one of Robert Holmes' many fine contributions to the series. It takes us back to the very first appearance of the Master, who has used his hypnotic powers to take control of a plastics factory. He's collaborating with the Nestene Consciousness to create Autons and assorted deadly items for a new invasion... The Master's first story is here read beautifully by Geoffrey Beevers, who played this regeneration of the character (or so we tend to assume) much later in The Keeper of Traken. This is how we all fancy we sound when reading out loud! The inlay reprints Alan Willow's illustrations from the original Target book, together with the usual excellent notes from erstwhile BFS overlord David Howe. It's interesting to compare the Master, who arrives here fully formed (although of course Dicks wrote the novel in 1975, so he had the full range of Delgado stories to draw on in his characterisation), and the Nestenes, who, even all these years later, remain very mysterious. All we really know about them is what they do: download their consciousness into specially prepared plastic. Or should that be "its" consciousness? It's not entirely clear: in other stories the Nestene seems to be a single being, but here we hear Autons talking about a High Command, and there is an Auton leader. Perhaps it's just that, as we saw in recent television episodes, the Nestene can choose to give its Autons a temporary consciousness of individuality. Some of the language and storytelling reflects that this is a book from different times. The Master's "dark", "foreign" look is repeatedly, and embarrassingly (for a modern reader) stressed, while the infamous doll that threatens a factory owner is "one of the most evil-looking dolls he had ever seen in his life". Why? Because of its "slant-eyed Oriental face". Such elements are particularly striking in a story that reflects contemporary concerns about Japanese-led modernisation and foreign ownership of British factories. Jo Grant, here making her first appearance for the second time, is brave, endearing and lovely, but she's a child rather than a woman, completely out of her depth and getting into terrible trouble, and that she fitted the format of the programme so much better than the intelligent, capable Liz reflects somewhat poorly on the programme and, perhaps, this Doctor. Oddly for one of the most horrifying of Doctor Who stories, the novelisation is quite childish, but of course the novels were squarely aimed at very young children when it was written. I must have read the original novel a half dozen times at least as a child, and at the age of ten I'd have fought anyone who denied its place in the pantheon of literary greats. Most readers will already know if they'll enjoy this or not, but adult fans may find it more an indulgence than a whole-hearted pleasure. There are many nice touches to the writing, though, such as "a horsebox of a different colour", and the story is quite an epic, the Master and the Nestenes causing a national emergency with their schemes, and the humans responding with soldiers and jets – and unlike the epics of previous seasons, it doesn't drag on for three episodes too many. It's full of frightening ideas, and its influence on Steven Moffat's Who – its interest in making the ordinary seem extraordinary and terrifying – probably can't be over-stated. Starring Colin Baker as the Sixth Doctor and India Fisher as Charley, Paper Cuts follows straight on from Patient Zero’s cliffhanger. Like the TV story Timelash, this sees the Sixth Doctor returning to the scene of a Third Doctor adventure. With fortuitous timing it’s Frontier in Space (recently out on DVD), so we meet once again the reptilian Draconians, Jon Pertwee’s favourite aliens. Fifty or sixty years ago, in the 68th year of the Serpent, the Red Emperor of Draconia isolated the planet to keep out a plague, ending a thousand-year empire. Now, in the 80th year of the Blood, four men, “the highest, the lowest, the bravest and the wisest”, are summoned to serve as vigilants in his tomb: a prince, a fisher-catcher, the disgraced captain of the Imperial Guard and the Doctor. One will become the new Emperor, but what terrible secret awaits him? Though setting a second story in a row in an isolated location makes for a little repetition, the “cold empty rooms with paper thin walls” make for a novel setting, and paper is a material that lends itself very well to audio drama. Overall, an exciting and innovative adventure. 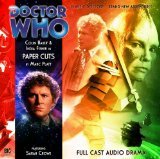 Doctor Who: Paper Cuts, by Marc Platt, Big Finish, 2xCD. Nathaniel Cade is a vampire, bound by voodoo since 1867 to serve the President and his officers, to "support and defend the nation and its citizens against all enemies, foreign and domestic". A lost extract from the Nixon tapes establishes that the curse leaves Cade to decide for himself who are the enemies of the United States – good news for Woodward and Bernstein! And if the President himself was an enemy of the United States? We may find out in future novels. In this one Cade faces both types of enemies: while terrorists steal body parts from soldiers' corpses and send them to the US for purposes unknown, shadowy conspirators take the opportunity to strike at Cade and his colleagues. In this kitchen-sink cosmos almost everything fantastical is real, especially the stuff from the movies – vampires, werewolves, Frankenstein monsters, zombies, etc – though there's a scientific basis to it all, we're told. Early chapters are highly reminiscent of the first Hellboy film, even down to the callow POV agent. Zach Barrows, a self-described "useless douche-nozzle", thinks his new assignment's a punishment for naughtiness with the President's daughter, but by the end he's earned his place in the book – and by Cade's side. The narrative takes the over-traditional Highlander approach – passages in the present, intercut occasionally with relevant episodes from the past – but with 70 chapters that average under six pages it can't help being punchy. The opening left me expecting a Clancy or McNab style military thriller, but the bulk is much more like 24, with crooked agents, conspiracies, power struggles, big shocks and chains of responsibility that lead all the way to the top. It's a lot of nonsense, but it's often very exciting. Farnsworth takes a canny approach to his finale, gambling upon a small number of very tough enemies where many writers would have gone for a horde, making for an tense, tactical battle that really tests his heroes. Blood Oath: The President's Vampire, Christopher Farnsworth, Hodder & Stoughton, tpb, 398pp. The greatest strength of this adventure is Nicholas Briggs, providing both the Dalek voices and some terrific dialogue for them, though Michael Maloney runs him close as Fratalin and his 799 familiars. Fratalin is a Jagrafin, who can separate out pieces of himself to act as independent agents, and then conjoin with them once the work is done. It’s “one of the remotest periods of space-time the old girl’s ever travelled in”, as the Doctor notes, and Amethyst Station is being prepared for the arrival of the mysterious Viyrons. For once the Doctor’s not just walking into trouble, he’s also bringing it with him. Charley, originally an Eighth Doctor companion, is “fading in and out of existence”, and the Doctor doesn’t seem to know about her past (his future). After a little while chilling in the Zero Room, Charley rows with Mila, who claims to have been hiding invisibly in the Tardis since the very early days (cue blushes on the part of Jamie and Victoria). When things go sour the Doctor’s not there to help: he’s already being escorted to the Amethyst’s nearest airlock. This isn’t a perfect story. The Sixth Doctor seems to have lost the light touch of some earlier audio adventures, and is back to the blustering and bellowing of his television run. The set-up feels much like the Doctor wandering into the first moments of the BSG mini-series; the Viyrans look very much like Cylons. At the conclusion the Doctor weirdly decides to pop back out of the Tardis for an extra chat with the Daleks. And his characterisation is a bit off: he spends an entire episode yelling at Fratalin to lower his force fields and surrender to the Daleks. But Briggs continues the process in which he has played such a big part: returning the Daleks to the height of their sixties cool. This story features the Dalek Time Squad, and their leader the Dalek Time Controller, a slightly less insane version of Dalek Caan. Briggs makes them dangerous adversaries (both physically and intellectually), and delivers their dialogue with the same talent and relish he brings to the TV show. If I didn’t enjoy the bits with Charley quite as much, perhaps their pay-off will come in future adventures. Doctor Who: Patient Zero, Nicholas Briggs, Big Finish, 2xCD. Rhys Hughes has blogged about his habit of including real people in his novels and stories, and I was indeed "glad and amused" to find a Theaker on the list! There was also a (John) Theaker in Mike Chinn's Sailors of the Skies, a Damian Paladin story in Dark Horizons #55. An excellent collection of clips from the BBC radio archives; covering everything from Christopher Eccleston’s round of interviews in 2005 to promote the new show to David Tennant’s promotion of the 2009 Easter special, taking in Jo Whiley, Dale Winton, Mitch Benn, Simon Mayo and Barney Harwood on the way. It’s fascinating to hear Eccleston discussing the programme, knowing now that by this point he’d already decided to quit. At one point he slips, and mentions being naive, having forgotten that Russell T Davies would be constrained by writing Doctor Who, then quickly backtracks to say he’s writing at the top of his game. Discussing incessantly the psychology of the Doctor and the aliens, you get the impression that he’d be very much in agreement with those who bemoaned the sillier aspects of the show. He’s far from humourless, though: asked what the interest of the character is, the answer is that he’s a 900-year-old alien who used to look like Sylvester McCoy! It’s a bit unfortunate that the CD includes a news report claiming that Eccleston didn’t want to be typecast, which was (as I understand it) the invention of BBC PR, quickly retracted. Doctor Who at the BBC: A Legend Reborn, curated by Andrew Pixley, presented by Elisabeth Sladen, BBC Audio, 2xCD, 1hr35. Since this is Jamie’s story, it begins with bagpipes, of course. Forty years after his travels with the Doctor, Jamie doesn’t remember anything except the events of The Highlanders. But a representative of the Celestial Intervention Agency reverses the memory wipe to hear about a Second Doctor/Jamie/Zoe adventure in London, 1688. It’s the year of the Glorious Revolution, when King James VII gives up his claim to the throne, a decision Jamie says will lead to decades of bloodshed in Scotland. In this two-episode story, Jamie tries to change the course of his country’s history by persuading the king to stay and fight, much to the Doctor’s dismay. It’s all quite serious, but of course there’s still time for Jamie and the Doctor to dress up as washer-women. Like dozens of Doctor Who stories before it, this introduced me to historical events of which I’d been unaware, while threading an exciting story through that history. Best of all, this sees another run-out for Frazer Hines’ frighteningly good Patrick Troughton. While I thoroughly respect Big Finish’s reasons for not recasting the early Doctors for new full-cast dramas, Hines’ performance as the Second Doctor makes a powerful, respectful argument for reconsidering that stance. My only criticism is that the story’s epilogue doesn’t quite ring true, though it’s perhaps necessary to restore the status quo. The running time includes about ten minutes of entertaining extras. The Companion Chronicles: The Glorious Revolution, Jonathan Morris, read by Frazer Hines, Big Finish, 1xCD, 1hr8. Casting Chappell of McLeod’s Daughters in the lead here is a bit unfortunate, good as she is, because it highlights that the storyline is pure Hallmark “woman in trouble” melodrama. The other problem is that she just seems too intelligent to behave this stupidly, failing to go to the police even after Evan’s been in the house, and letting her husband beat up an innocent man. A couple of scenes will have everyone putting a hand to their mouth in horror – I’ve never been so happy to read that “No animals were harmed during the making of this film” – but for each of those there’s another that may have you laughing out loud. For example, the effect of Evan sitting in the rain to watch television is hilarious rather than chilling. Coffin Rock’s directed with some panache, the score is good, and the actors are all well-cast; it’s a decent stab at doing something special with well-worn subject matter. If it was a TV movie, you’d be surprised at how good it is. As a cinema release, it would have been a bit disappointing. Overall, worth renting if you like this kind of thing. Coffin Rock, Rupert Glasson (dir. ), Aus, 92 mins. Grant Mazzy (Stephen McHattie, the original Nite Owl in Watchmen, and veteran of every TV fantasy series from Fringe to Beauty and the Beast) is an unhappy DJ whose day in Pontypool – the village in Canada, rather than the town in Wales – begins with an eerie encounter: an incoherent woman at a stop sign who vanishes into the snow. Once Mazzy’s in his booth, a story breaks: three people held hostage in a fishing hut, who escape after police intervention. By ten o’clock the whole town is going crazy: mobs roam the streets chanting odd slogans. The infection is spreading, but how? Pontypool is reminiscent of Orson Welles’ radio adaptation of The War of the Worlds; we hear snatches of what’s happening at second hand, by phone, radio message and television report. Although it’s adapted from a novel (Pontypool Changes Everything by Tony Burgess), it’s not a surprise that there was also a radio play, included here exclusively on Blu-Ray. But the result is not uncinematic: it looks like a movie, feels like a movie, and is extremely tense; lacking our usual omniscience, we share the growing fear of Mazzy and his producers. Though it’s been compared to John Carpenter’s The Fog, I think another comparison is even more apt: with its fatalistic humour, excellent performances, even its twist ending (watch this one through to the end of the credits), and most of all in the way it tests the character of its protagonists, Pontypool captures the spirit of The Twilight Zone at its very best. Pontypool, Bruce McDonald (dir. ), Canada, 93 mins. In what is effectively an unofficial remake of The Beast from 20,000 Fathoms, a military experiment causes the collapse of an ice bank, freeing a prehistoric shark and a giant octopus to resume their 18 million year old battle. Debbie Gibson plays McNeil, a marine biologist who drinks whiskey from a brown paper bag, and tries to convince the world to take her seriously. When the fighting moves to California the authorities turn to her for help. I wouldn’t recommend this film (currently showing on SyFy) to anyone. The problem isn’t that the acting is woeful or that the script is dire (though they are), it’s that the entire film is painfully dull. And to make a dull film featuring a mega shark and a giant octopus is quite an achievement. Perez’s previous film, Monster Island, was equally bad, but it was at least entertaining. It featured a giant dancing mantis, for example, something from which many films would benefit. There are two scenes in this one that everyone talks about: where the shark leaps out of the ocean to bite a plane, and where it takes a chunk out of the Golden Gate Bridge. Those scenes are admittedly awesome, but they are also unbelievably short, barely seconds long. If you’ve seen the trailer, or even the posters, watching the actual film adds little to the experience. This film needed more stupidity (though one scene where the scientists experiment in a lab with variously coloured liquids made me chuckle), and fewer recycled shots. One day, this may well be remade, and that remake may well be one of the greatest movies of all time, but in the meantime, if you’re in the mood for so bad it’s good, watch something like S.S. Doomtrooper instead. Mega Shark versus Giant Octopus, Jack Perez (dir. ), USA, 85 mins.